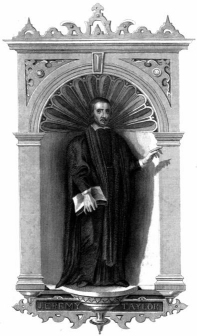 Born in Cambridge in 1613, Jeremy Taylor was educated there through his university studies in theology. His eloquence attracted the attention of Archbishop William Laud, who made Taylor his chaplain and secured him a position as a fellow of All Souls College, Oxford. Taylor chose the side of the King in the English Civil War. After the collapse of the royal cause, he became chaplain to the family of Lord Carbery and remained at his estate in Carmarthenshire, Wales, until Charles II took the throne in 1660. Among his eloquent writings, Liberty of Prophesying (1647) is a plea for toleration in matters of religion. It was followed by The Life of Christ (1649), Holy Living (1650), Holy Dying (1651), and a manual of devotion entitled, The Golden Grove (1655). Following the restoration of the Monarchy, Taylor's loyalty was recognized, and he was made Bishop of the Diocese of Down and Connor, in Ireland. He continued to contend for toleration, but his stance was out of fashion in a nation that had been wracked by civil war. His eloquent preaching is seen in his published sermons, including XXVIII Sermons (1651) and XXV Sermons (1653), as well as other, individual sermons. Taylor's style in preaching and writing makes use of rich sensory imagery. He is the last of a "golden age" of preachers that included John Donne and Lancelot Andrewes. His writing consists of a wealth of allusions to biblical, patristic, and classical material. Despite Taylor's unquestioned literary genius, he was not asked to take part in preparing the Book of Common Prayer of 1662. However, his eloquent prayers have been included in subsequent Prayer Books of the Anglican Communion. His theology has sometimes been questioned as, for example, by Samuel Taylor Coleridge, who claims that Taylor seems to "present our own holy life as the grounds of our religious hope, rather than as the fruit of that hope, whose ground is the mercies of Christ." This criticism, however, fails to take account of the fact that the primary aim of Taylor's writing is the spiritual growth and sanctification of the believer, not the discussion of the basis of the believer's justification. Taylor ranks as one of the great spiritual writers known as the "Caroline Divines," and his works are among the greatest spiritual classics of the Christian tradition.